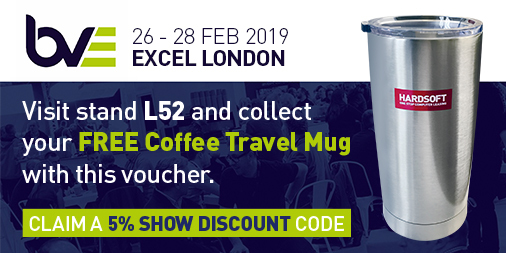 Home Blog Leasing Meet Us at BVE 2019 and find out how Leasing can Benefit You. We’ll be exhibiting at the Broadcast Video Exhibition (BVE) again this year, making it our 8th year. This year the show runs from the 26th to 28th of February at Excel London, we’ll be there demonstrating how our flexible leases and solutions can benefit the broadcast business, so come and see us. Plus, if you bring the voucher below we’ll give you a FREE travel mug, as well as a 5% show discount code! We look forward to BVE each year because we get to experience the latest technology hands-on, as well as meeting our existing and potential new clients. With around 300 companies attending there will be lots to see with businesses showcasing their products whilst an extensive program of free seminars featuring more than 200 speakers and over 100 sessions across the 3 days. We’ll be on stand L52 so come along and meet some of the HardSoft team who will be there explaining how our leasing can benefit those in fast-moving tech-heavy industry. You’ll find that leasing turns the un-affordable into something very affordable indeed. Bring your voucher for a FREE travel mug! We have new financial solutions on offer this year, such as our unique & flexible DaaS solution for Apple, Devices for Teams. An agile Apple subscription tailored for dynamic, high growth businesses. Pushing aside traditional ‘leasing’ restrictions, the solution allows for continued renewals, changes, additions and returns to empower your workforce and suit the needs of your changing landscape. We also have a new type of leasing option, with Flexi-Lease Plus coming soon! We have been building custom PCs at HardSoft since we started out in 1984 but there is an ever-increasing demand for bigger, better, and faster custom built computers, which comes as a result of our customers need to use the highest spec graphics and applications which often don’t work to their optimum capacity with ‘off the shelf’ PCs. We’re now using AMD Threadripper 2 CPUs in our custom built PCs, come and talk to us about all your bespoke needs. An iMac Pro will be on out stand to try! 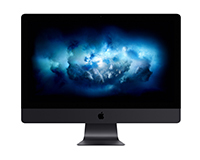 We’ll also have an iMac Pro on the stand with us for you to try out, so make the most of it and head over to see us! If you are heading to BVE this year make sure you come over and visit our IT financing specialists to discuss all of your technology needs. Something to bear in mind – we’ve been extremely busy at previous BVEs, so if you’d like to have a detailed chat we’d advise booking a time slot. If you’d like to do this, just email us at sales@hardsoft.co.uk and we’ll reserve you a time. Look forward to seeing you there!